My partner Mack’s startup Taproot Edmonton is doing local beat reporting in a variety of subjects, including technology, health innovation, music, and media. Subscribers can get these topical roundups delivered straight to their inbox, and starting this month, my Food Notes will appear as a food roundup! Taproot will be compensating me for this, but it won’t change the fact that Food Notes will continue to be published on my blog. Also, if you have subscribed to receive my blog posts through the Feedburner link, those e-mails will keep coming. Thanks for your ongoing support! The new season of Top Chef Canada debuts on Food Network Canada on April 1, 2019, and Edmonton might finally have some local content to cheer for. Chef Alexei Boldireff of Baijiu will be competing alongside two other chefs for the chance to join the 11 other finalists. In the six previous seasons of the show, there has never been any Edmonton-based chefs selected for the program. It’s also interesting to note that many of the competitors over the last few seasons have represented some of the same restaurants: Ayden Kitchen & Bar in Saskatoon, Fable in Vancouver, and Richmond Station in Toronto (opened by a previous Top Chef Canada champion). I’m sure the pool is limited to those who apply, but I’d like to think the talent in this country is deeper than the show has portrayed. Century Hospitality is the first larger local enterprise to open up delivery-only ghost kitchens under several new branded banners: The Flying Dodough, Nooch, and Chuck. Remedy Cafe opened their brand new Raymond Block location in Old Strathcona at 104 Street and 82 Avenue. YEGHalal shared that there’s a new fried chicken joint in town called Frick’N Chick’N at 4351 167 Avenue. 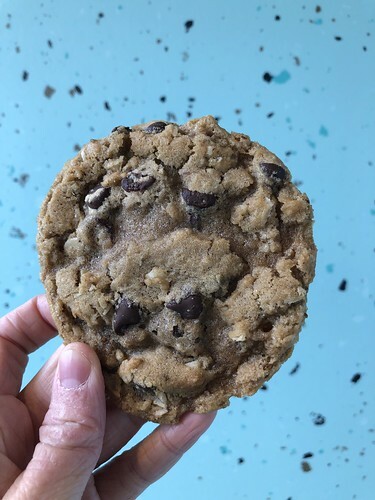 It’s new to me, but Tafeli Gourmet Cookies has been around for about 10 months in Riverbend, at 5647 Riverbend Road. Food4Good announced the dates of their next several discounted Fruit & Veggie Sales: March 28, April 25, and May 16. To commemorate Earth Hour on March 30, seven local restaurants have developed climate-friendly menus (read: vegetarian and locally-sourced options). This year’s Chef in Residence at NAIT will be hosting a lunch on April 11, 2019. Enter here for your chance to win tickets. Gangnam Street Food received a mostly positive review from the Journal, who praised its value and portion sizes. 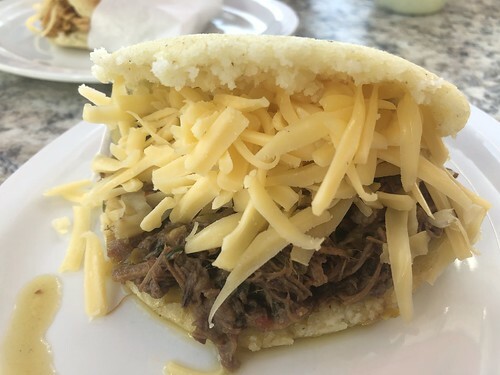 Rat Creek Press reviewed La Bodeguita de Cuba, the restaurant that moved into the Alberta Avenue space formerly occupied by El Rancho. Graham revisited 104 Street gem Tzin, and finds that the excellent food and service has not changed. Frozen dumplings by Mai Nguyen (she has held several dumpling pop-ups at Prairie Noodle in the past) are now available at the restaurant. 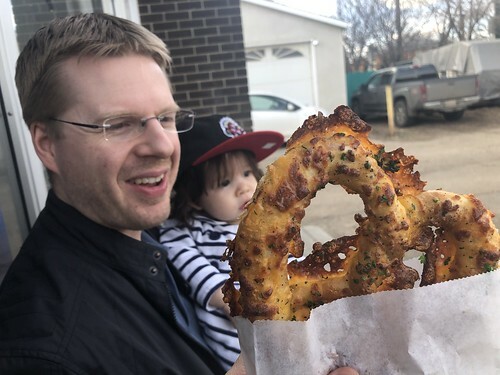 People seem to love lists, and this one from Big Seven Travel on the 50 Best Burgers in Canada features 4 local entries: YEG Burger, 1st RND, Burger Baron, and The Burger Joint. The latest Fast Food webisode features Langano Skies chef/co-owner Amsale Sumamo’s recipe for fül, a fava bean-based breakfast dish. Linda shares a sponsored post on how to have a date night at The Rec Room. Northlands is currently seeking youth Agricultural Ambassadors, aged 12-17. I definitely need a pick-me-up over the weekend, and Mack had great timing when he was able to snag the last two donuts from Farrow that day. 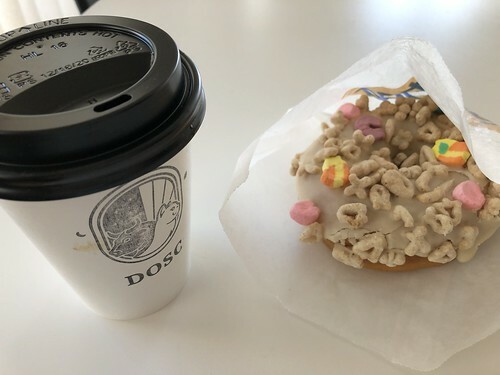 The cereal milk icing paired nicely with a coffee from DOSC. I was fortunate to attend the kick-off to the 15th annual Downtown Dining Week last week. This year, they have a record 50 participating restaurants (14 of them new), and for the first time, are offering weekend brunch menus alongside the lunch and dinner offerings. The event runs March 8-17, 2019. The best bite we ate that evening was the poached pear and lemon ricotta cake from the Hotel Macdonald – beautiful presentation and just the right amount of sweet. My friend Su and I also met up for a Downtown Dining Week brunch at Central Social Hall. Neither of us had been for brunch before, and agreed that the ample windows made it an ideal daytime space. 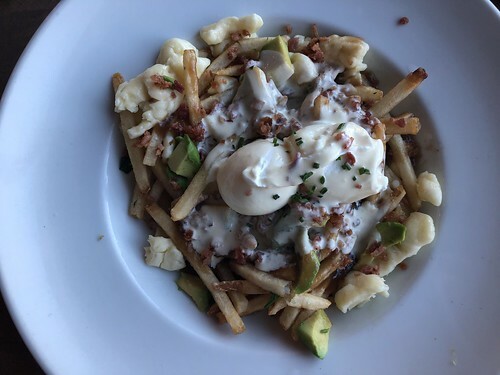 I enjoyed their take on a breakfast poutine (the kitchen was very generous with the cheese curds), but had only wished that the eggs had been soft poached. The doughnuts, on the other hand, had a great chew and subtle cinnamon flavour. 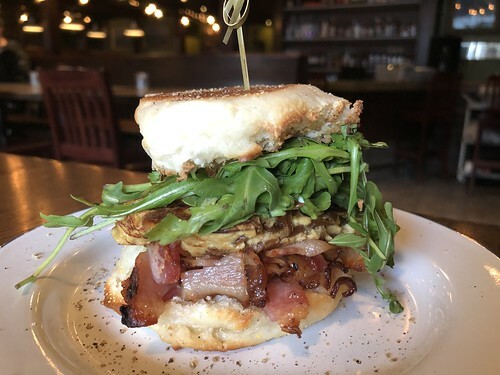 For more brunch options during Downtown Dining Week, check out Andrea’s sponsored post. 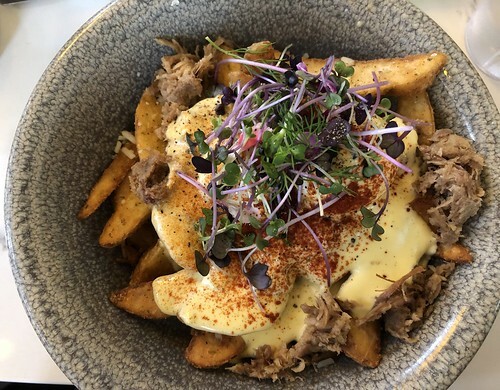 March is the season of food lists in Edmonton, with both the food issue of Avenue Edmonton and The Tomato’s Top 100 Best Things to Eat or Drink dropping on the same day. Avenue’s “Best Overall” category saw Biera take the top spot, followed by RGE RD, Cibo Bistro, Bundok, and Uccellino. 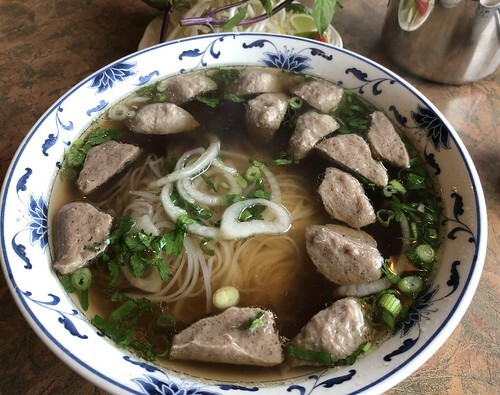 It’s also worth noting that a couple of ethnic eateries – Kanto 98 St. and An Chay – are included in the “Best New” category. The Tomato’s list placed RGE RD’s blood sausage as their top item, followed by dishes from Uccellino, The Butternut Tree, Corso 32, and Cibo Bistro. Melt Sandwiches is set for their soft opening on March 5, 2019. From the folks behind Cookie Love, their newest venture in the former Daily Planet space on the second floor of the Bell Tower is all about gourmet grilled cheese sandwiches and soups. There’s a crowdfunding campaign underway for Glass Bookshop, which hopes to be Edmonton’s newest bookstore and wine bar in the Quarters. The folks behind the Little Brick Cafe development are adding a “cousin” in Riverdale called Umphreville Block, promising a bistro pub, among other things. Knosh Catering hosts semi-regular afternoon teas at their Crestwood Curling Club location. Their next event is a Dr. Who-themed tea on March 17, 2019. The cost is $35 per person, and reservations are required. Lydia offers a photolog of her recent meal at Al Centro. Graham wasn’t as floored as other reviewers have been with Formosa Bistro. Don’t click on Sharon’s photolog about OEB if you’re hungry! Crystal paid a visit to The Provincial Kitchen & Bar, and particularly enjoyed their doughnut grilled cheese. Kind Ice Cream, a small-batch ice cream shop that hopes to open in Ritchie in the spring, has launched a Kickstarter campaign. They aim to raise $15,000. This Postmedia piece highlights Shane Chartrand’s restaurant in the River Cree Resort, along with some details about his forthcoming cookbook called Tawaw: Progressive Indigenous Cuisine. Where Edmonton recommends new-ish restaurant Three Vikings. Club House for Chefs interviewed a number of local chefs, including The Marc’s Spencer Thompson, Baijiu’s Alexei Boldireff, SC at River Cree’s Shane Chartrand, and Wishbone’s Brayden Kozak. It was great news to hear City Council went ahead with funding for the Wild Heart Collective Program today. Taproot Edmonton has a summary about the program in their latest Council Roundup – they have plans for a 15,000 square foot food incubation hub called The Public, located at 10560 107 Street. The space includes commercial kitchens to support small food businesses, and they hope to open in October 2019. There is an option to build a year-round, multi-day public market in the future as well. The Journal also covered the story. There’s some fascinating oat-based products coming out of NAIT’s research kitchens, such as ice cream, yogurt, pastas, and even cheese. Seedy Sunday is returning on March 17, 2019, from 11am-4pm at the Central Lions Seniors’ Centre at 11113 113 Street. There will be presentations on a variety of topics, including soil health, mushroom growing, and yes, cannabis cultivation, and lots of vendors for those already planning their gardens for the year. 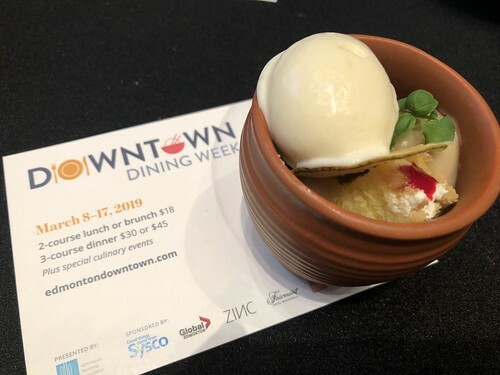 Downtown Dining Week, which celebrates the range of cuisine available in Edmonton’s core, is back for its 16th incarnation for 10 days from March 8-17, 2019. This year, they have nearly 50 participating restaurants, all offering fixed-priced multi-course deals: 2-course lunch or brunch for $18, or 3-course dinners for $30 or $45. In addition to the special menus, the Downtown Business Association has also put together some special events to consider, including a cookbook sale at Audrey’s, tours of the City Market, cooking classes, and even a community potluck. The Iconoclast in the Oliver Exchange Building at 103, 12021 102 Avenue is officially open. 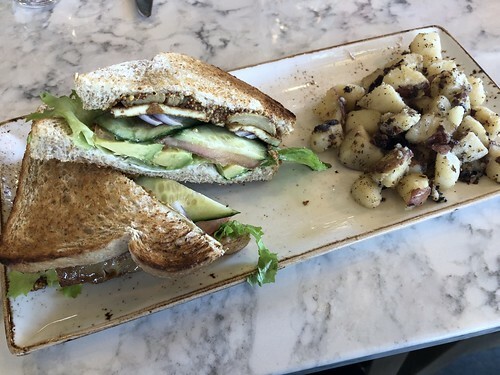 A second location of plant-based chain Copper Branch is now open in South Edmonton Common, at 2205 101 Street. A second Cinnaholic, the vegan cinnamon bun bakery chain, is now open in Old Strathcona at 10345 82 Avenue. 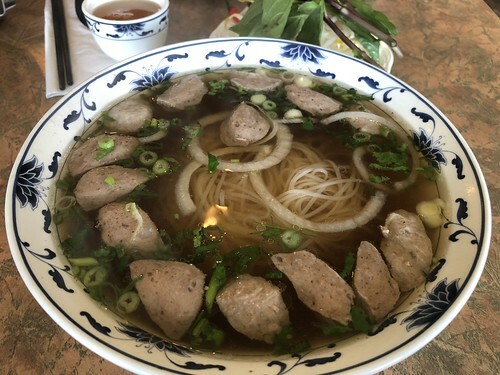 Filistix shared a sneak peek of their new Downtown location, due to open in April 2019 at 10621 100 Avenue. Ramen Misoya, with locations in Toronto and Montreal, will be expanding to Edmonton’s 104 Street in the Icon II. Bru in Oliver is now closed. Food4Good is hosting another Fruit & Veggie Sale on February 26, 2019. The 2019 National Brewers Cup competition will take place March 1-3, 2019 at the Transcend in Ritchie Market. 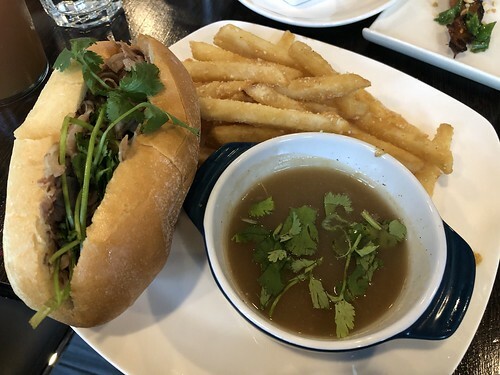 The next Northern Bites experience on March 5, 2019 features a visit to Barr Estate Winery and a cooking lesson and tea tasting at Formosa Bistro. Tickets are $70. Leftovers YEG is hosting a meet up on March 11, 2019 for those wanting to learn more about food waste and the organization. Tickets for Avenue Edmonton’s Best Restaurants event on March 18, 2019 are still available. Tickets are $50. Yellowhead Brewery will be celebrating the first anniversary of its Drag Brunch on March 24, 2019. Tickets are $30 and include an all-you-can-eat buffet. Eat North is bringing its pop-up Drags Benny event to Edmonton’s Fairmont Hotel Macdonald on March 30, 2019. Tickets are $70, and include a cocktail and brunch canape hour, and a 3-course brunch. Proceeds from the fundraiser will go towards Canadian Pride initiatives. The Journal enjoyed the fare at new-ish suburban restaurant Suda Thai Cuisine in Sherwood Park. 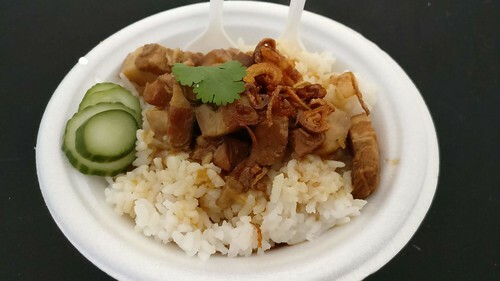 Sharon shares her favourite items at Gangnam Street Food. Lydia posted a review of Golomein. 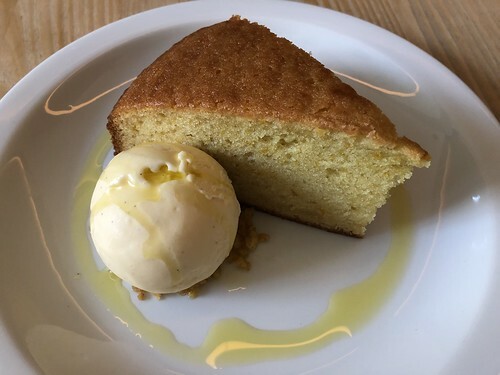 Liane wrote a great piece about how certain restaurants, including Kanu and XIX Nineteen, have been able to snare a strong Head Chef. 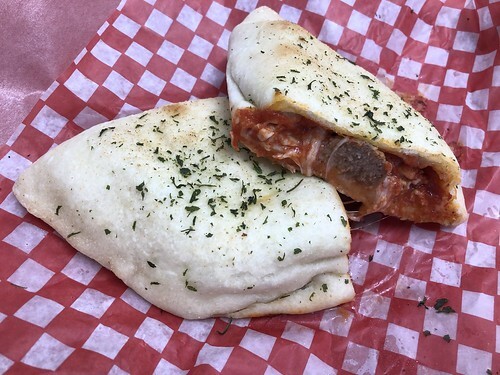 Also from Liane – she has more details behind Have Mercy’s change to a “recession-proof” menu. Giselle Courteau of Duchess Bake Shop shares her recipe for Spanish-style baked eggs in the latest Fast Food webisode. It’s a recipe that will appear in her second cookbook, Duchess at Home, due out in the fall. Chef Lasantha Mendis who works north of Fort McMurray competed in the fourth international bread baking competition Festival International du Pain 2019. Vancouver-based Chef David Hawksworth will be NAIT’s 11th Chef in Residence, from April 8-12, 2019. Eat North is a finalist in the Digital Presence category for this year’s Alberta Magazines Awards. Alberta set a monthly record on restaurant and bar spending in December 2018, totaling $810 million. The average Albertan spent almost $190 on dining out. 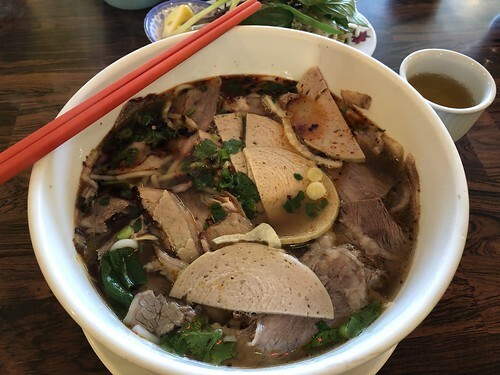 It’s always a good day for soup in my books, and the bun bo Hue at King Noodle always hits the spot. 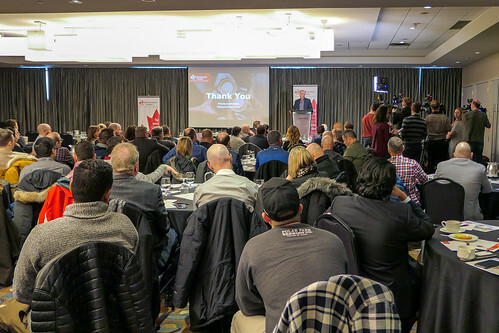 Last Tuesday, Restaurants Canada, led by Board Chair Patrick Saurette (from The Marc), held a media conference to launch their Restaurant Realities campaign. Speakers shared statistics about the loss of hospitality jobs, increase in operational costs, and decline in foodservice sales in Alberta, attributing these to some of the policy changes made by the current provincial government, such as minimum wage and holiday pay increases, and the carbon tax. They released a promotional video featuring many local restaurant operators who share the hardships they have faced. Italian Centre Shop President Teresa Spinelli, who mentions in the video how challenging it is to employ people with disabilities with the current minimum wage, faced immediate criticism on social media, and has since tried to clarify her company’s stance on fair and equal pay. The event was further politicized when United Conservative Party leader Jason Kenney delivered a policy statement about decreasing the minimum wage for youth workers and alcohol servers should he win the election. Garner Beggs, co-owner of Duchess Bakeshop and Cafe Linnea, publicly stated that he would support a reduction in pay for younger staff. However, two days later, the company posted a statement clarifying that Garner was not speaking on behalf of the businesses. Congratulations to Brio Bakery for the opening of their brick and mortar location in Oliver Exchange (12021 – 102 Avenue) last week! The latest type of plant-based establishment to open is the Sly Fox Vegan Butcher at 10722 124 Street, offering plant-based meat alternatives. The business is run by the same folks behind The Clever Rabbit (and is in the same divided space). A new butcher shop called Meat Head is on the verge of opening, located at 7664 156 Street. Aditya (Addie) Raghavan is back from India! He will be sharing many of the delicious flavours and foods he discovered through his extensive travels in India at a pop-up dinner at Get Cooking on March 4, 2019. Tickets for the 8-course meal are $90. The Edmonton Chamber of Commerce is hosting a Taste of the Chamber on March 6, 2019 at the Jubilee Auditorium. General admission tickets are $30, and sampling tickets are $1 each. The Roundhouse is hosting a free information and networking session for those running food businesses that “address food security, income, and other social issues". It is taking place on March 6, 2019. The next Prairie on a Plate dinner will be held at Cafe Linnea on March 7, 2019. Tickets for the 3-course dinner are $55. The Canadian Agri-Marketing Association is sponsoring a free movie screening on March 11, 2019 of Before the Plate, a 2016 production that captures 8 different farm operations to showcase how food is produced. Pre-registration for the event at MacEwan University is required. Save the date: the annual Culinary Cook-off at Mount Royal is taking place on April 13, 2019. Graham thinks the Crudo family has another winner on their hands in Amore Pasta. Crystal is the latest to review OEB. Have Mercy’s revamped menu features dishes that are all priced at $7.95. Liane shared the sad news that Bistro Praha co-owner Sharka Svajgr has passed away from cancer. The Cove Tea is hoping to crowdfund $5,000 through ATB BoostR to help open a tea shop. Hansen Distillery has started their one year countdown to the end of the three-year aging process required for whisky. It will be the first Canadian whisky made in Edmonton. Chartier is recruiting a new head chef to replace the departing Steven Brochu. They have put together a beautiful recruitment video. Sharman recaps the recent Swine and Dine dinner held at Salz. Inspired by Sugared and Spiced’s popular Cake Club, Culina is offering a Catering Club. It includes three 4-course dinners for 8 people. It is priced at $999, with 30 memberships available. The local bloggers behind Sugar Loves Spices offer private cooking classes. My first day back at work after my maternity leave coincided nicely with a team lunch at The Moth. I tried their tofu clubhouse and enjoyed it well enough; I found the avocado to be a nice addition.